Will Ship Direct From Our Supplier, to You ! - Brand New !!! The Party-Que puts the Worlds Best parties in Your Own Backyard! New Charcoal Party-Que for Home of Picnics, large to roast whole lamb,pig or 1 dozen chickens roasts while you enjoy your cocktails and be the envy of the block, neighborhood, friends ! Summertime Fun! We offer two models: the 300 and the 350 model. Both are shown on the adjacent picture. They are made of heavy duty Galvanized steel. Model 350 may show a grill rack-but that is extra as you can see below, if you need that for grilling hamburgers or steaks or pork chops or other meats. Either unit is set up for Skewer Type roasting. The skewer is made out of Aluminum and the Motor RPM is 7 1/2. Capacity: 80 lbs. of meat or 54" length of an animal approx. All Base Models include Base, Skewer and Motor. Other unit-that is available WITH LEGS - Model 350 Specifications: 54" long, 24" wide and 28" high is $ 393.00. Approx. 64 lbs. net weight. The Party-Que is for Outdoor Use with Charcoal ONLY. Made of Heavy Duty Galvanized metal construction, rust resistant. Easy to secure lamb/pig on skewer with smart spine hooks. FULL WARRANTY. One year on the motor for any malfunctions that are not caused by misuse. Motor is to be sent back to us in the event that this happens so we may either repair or replace, from the MFG, not us. Specification and misc. info: is below. Base = Galvanized Steel, Body = 18 gauge, WSBU=20 gauge, WBU=height 18" x 53 1/2" width, Grill-chrome, Motor speed is 7 1/2" rpm ( 1 yr warranty on motor), Skewer material is Aluminum-length 60" x 7/8" diameter. The World's Best Party Rotisserie. We have a diagram of what Parts look like, we can fax to you-i have posted the 2 diagrams below, as well. Color Photos are with the accessories. 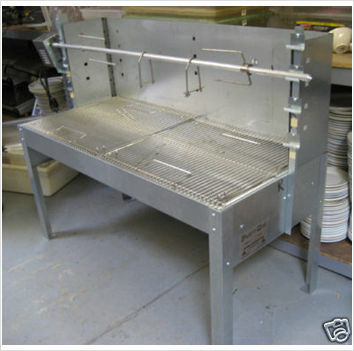 Grill (covers 1/2 of Base unit ) $59.00 This is for doing hamburgers or steaks, chops. Recipes You can Do: Chickens-holds up to 10 chickens at a time. or Whole Lamb-Holds up to 50 lbs. at a time. Whole Lamb cooks in 4 1/2 Hours., Whole Pig-holds up to 60 lbs at a time-whole pig cooks in 4 1/2 hours. or Turkey-holds up to 4 20 lb. turkeys at a time. Capacity: 120 lbs or 54" wide of animal. More tips on cooking: Set up your party-que on a level surface, free of combustible materials and debris. We recommend lining the base with heavy duty aluminum foil placed length wise in the base. The center sheet should be bent up slightly to keep any drippings in the built in collector. Using "Lump" or wood charcoal, fill only the 2 compartments with charcoal, leaving the center free for drippings. This prevents grease flare ups. Do not overload with charcoal, more can be added as needed. The optional grill can now be placed over the charcoal. Mount the skewer and lamb on the top hook with the pointed end facing left. Place the motor shaft into the end of the skewer so that the slot in the motor bracket engages the skewer post. Align the holes of the skewer and motor shaft and insert the center pin, spreading the ends of the pin slightly after insertion to keep it tight. The motor should be plugged into the extension cord desgined for outdoor use that is equipped with a 3 prong grounded outlet. Never place anything on top of the windshield cover, it becomes extremely hot and is not designed to support weight. Cooking tips: A 40 lb. takes approx. 5 hours to cook. Starting 2 hours on top hook, 2 hours on the middle hook and 1 hour on the bottom hook. When you move the skewer to the lowest position, move the charcoal under the shoulders and thighs of the lamb. Our resident BBQ expert recommends minimal seasoning of salt &pepper both inside & out, with garlic cloves inserted in the thighs and shoulders. Basting is not required, but you may wish to brush the lamb with an olive oil and lemon mix during the last hour to help crisp the skin. Chops & sausages, Souvalki, etc. may be cooked on the grills with the lamb is roasting on the spit. If you are also using the optional kokoretsi soulva, your unit comes with a 4th set of hooks in the lowest position. The kokoretsi souvla should be mounted while the lamb is in the top position only so it doesn't interfere with the operation of the main skewer. Kokoretsi should take no more than 1 1/2 to 2 hours to cook. Option: Model 300 is $ 385.00. -NO LEG MODEL. Net weight: 56 lbs. We ship these By UPS only.